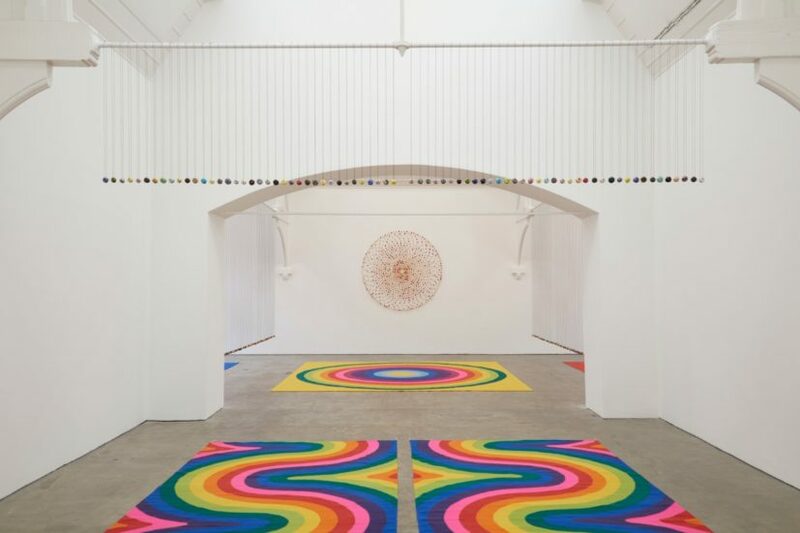 Internationally renowned artist Polly Apfelbaum’s immersive environments often draw inspiration from the legacy of Post-War American Art but also refer to Folk Art, Bauhaus and the Arts & Crafts Movement. Her major new show at Ikon is no exception, featuring textiles, ceramics and drawings that use every facet of the gallery. The exhibition title – Waiting for the UFOs (a space set between a landscape and a bunch of flowers) – refers to the 1970s song Waiting for the UFOs by British singer-songwriter Graham Parker, as well as to Surrealist René Magritte’s definition of a garden, mashing up retro pop culture with the fine art canon. When entering the first room, we are faced by Apfelbaum’s rainbow-coloured Life Spirit (2018), a wall that divides the large exhibition space and dominates our immediate field of vision. 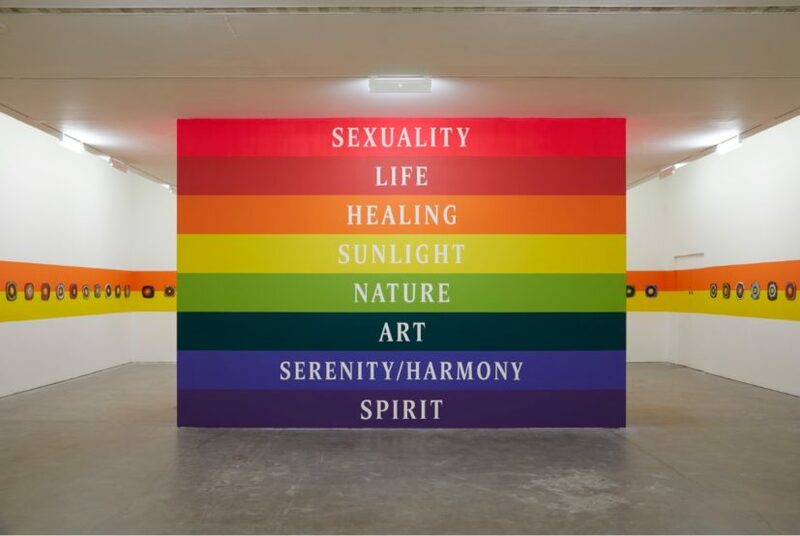 Commemorating forty years of the Gay Pride flag it also introduces the colour chart that the artist employs throughout the show. A wall-frieze of yellow and bright orange stripes forms the background for more than a hundred individual ceramic targets in different colours. Their distinctive pattern can be read as a reference to Colour Field painting, but also to dart games. On the second floor, the artist has created an immersive environment in which she has transformed the entire space with rugs, painted walls, drawings and ceramics, adding the floor as an important display element. Halfpipe (2018) is reminiscent of American artist Gene Davis’s Franklin’s Footpath for which she, in 1972, painted the street outside the Philadelphia Museum in colourful stripes. Apfelbaum’s ‘half-pipe’, a reference to skateboard culture, consists of a room-scale carpet with vibrant lines that are continued in paint on the gallery wall right up to the ceiling. The motif of a target appears again here with Wallflower (1990), made of paper flowers arranged in a circular pattern. This marks the moment, nearly 30 years ago, when the shape entered into Apfelbaum’s practise. Also on the second floor are a number of colourful carpets, spread out across the floors of the gallery spaces. Woven in Oaxaca, Mexico by artisans indigenous to the region and using traditional weaving and dying methods, their colours and use of geometric pattern recall Sonia Delaunay’s paintings, textiles and designs. A series of watercolours depicting targets displayed on the wall correspond with the geometrical shapes of the floor rugs. The work Headlines and Kneelines (2018) consists of beads hanging from the ceiling using different clays and glazes. The tension these objects create on their strings seem to visually reference a weaving loom. Their organic shapes form a contrast to the stark geometrical patterns of the carpets. Apfelbaum’s vibrant ‘Gesamtkunstwerk’ enters into a highly successful dialogue with the architecture of the Ikon Gallery’s spaces. 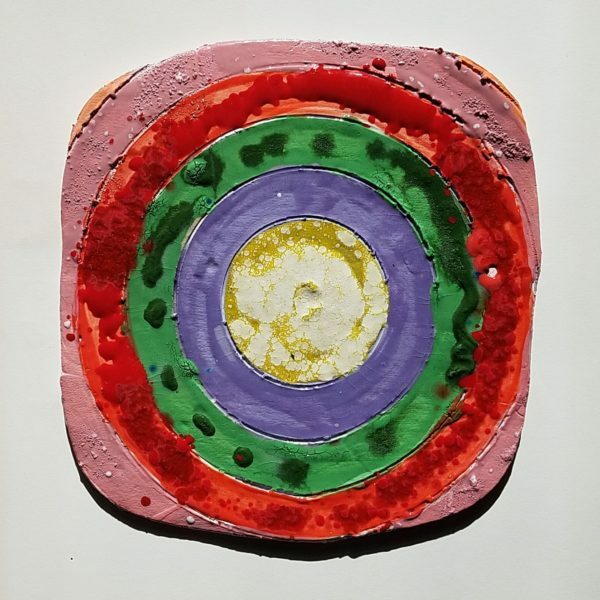 While the ceramics on the wall on the first floor are displayed more like in a classical museum display, on the second floor Apfelbaum invites the viewer to fully immerse themselves into what she describes as “an erupting rainbow volcano experience”. Waiting for the UFOs (a space set between a landscape and a bunch of flowers) brings to the fore essential formal qualities, especially colour and texture, that has always been key to Polly Apfelbaum practice. At the same time it inspires us – as the exhibition title already suggests – to question the conventional boundaries between high art and so-called popular culture.